It is our honor to be featured in Utah Bride & Groom Magazine’s 2013 issue. We were thrilled to have two of our invitations featured on page 30 in the editorial segment “Personality Type - fun fonts for fashionable couples”, which features unique typesetting, font pairings and font selections. One of our contributions is this floral beauty from our bride, JanEllen Melchior. 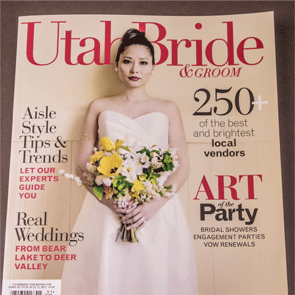 Utah Bride & Groom Magazine described the fonts we selected for JanEllen as “nostalgic yet modern”. Below is a glimpse of the rest of JanEllen’s beautiful invitations to show off how the whole set came together beautifully as a whole. Detail of the front cover And finally, a special shout out to those vendors whose inspiration and talents came together to create the 2013 cover. The cover is a visual icon for the year and it’s worth mentioning the people who brought it together. Congratulations to Marcus Gardner for the wardrobe styling, Versa Artistry for hair and makeup, Honey of a Thousand Flowers for the beautiful bouquet, Alfred Sung, via Lily & Iris for the breathtaking dress, Caterina for the location, and Heather Nan for her gorgeous photography. Kudos on your fabulous work. 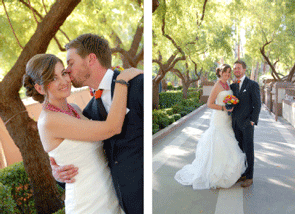 Congratulations to Tommi Ellingford-Wardle, February's Bride of the Month! We have an extra special feature for February's bride of the month. We’re not going to try to cover up the fact that Tommi is Ann Elizabeth’s best friend. Did that fact affect our decision to feature Tommi as our bride of the month... well maybe, except for the fact that Tommi’s invitations turned out so unique and such an expression of her personal style that the invitations are truly a favorite of the Ann Elizabeth team. So much so that we selected her invitations to represent us in our 2013 ads in Utah Bride and Groom Magazine and Salt Lake/Park City Bride Magazine. 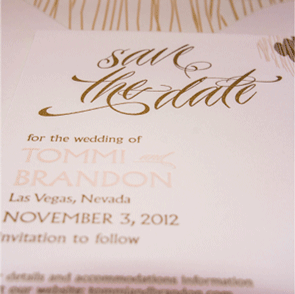 Our invitation consultant, Ruth Sorenson, sat down with Tommi recently to talk about her low key Las Vegas wedding and her wedding invitations. 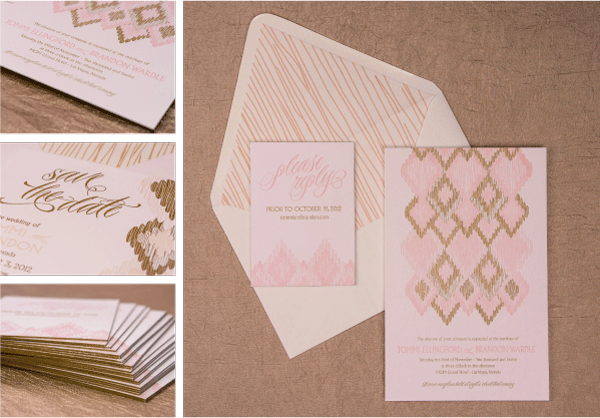 We hope that you will love Tommi’s “ikat” invitations as much as we do. The Interview:Ruth: When you first came to us were there any elements of the invitations that you were adamant about including?Tommi: I really wanted letterpress. 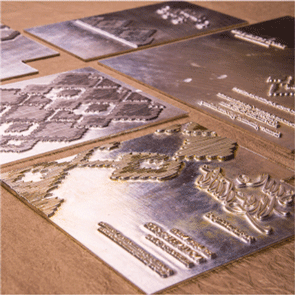 Second, after letterpress, was the idea that I wanted gold incorporated in some way. I wasn’t really sure about the pattern though, so we tried a bunch of different things. 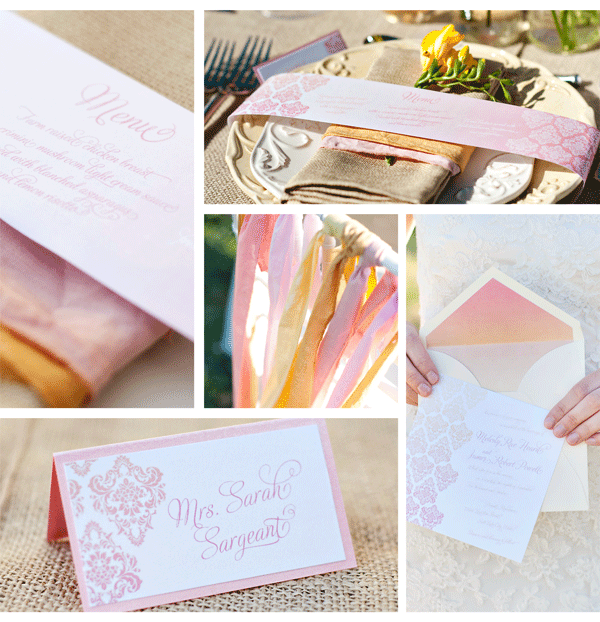 Ruth: What was the most important thing you wanted to convey to your guests who were receiving your invitation? Tommi: I wanted it to be an expression of my personality, but also give the vibe of what type of event it was. I wanted it to read as a classy and unique because it was not a traditional Las Vegas wedding. People have preconceived notions of what a Vegas wedding is, and I wanted to communicate this is not a little white chapel where Elvis is going to marry us. Ladies, put your dresses on. Ruth: Are there elements from your invitation that followed through into the decor of the wedding? Tommi: I used a pink tone in some of my jewelry, accessories and bouquet. The gold ended up working nicely because our dinner reception space had a rich gold earthy tone to it. Then of course working them into the playing card favors. 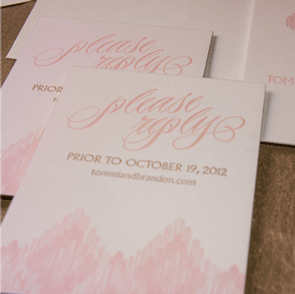 The invitation design also inspired my place cards because I wanted a continuous look and feel for my guests. Detail of Tommi's Letterpress Printing Plates Ruth: What advice would you give to brides that are looking to gather their inspiration?Tommi: I spent time like you recommended on Pinterest picking out invitations that caught my eye - positive or negative. It helped me understand what I didn’t want which I feel is just as important as figuring out what you do want. Doing research and finding inspiration helped a tremendous amount. Ruth: Are there any lessons you learned in the process of dreaming up your invitations that you can share with future brides? Tommi: I learned that I’m more indecisive than I thought. I feel like I came to you guys with an abstract idea and Ann came back with so many good designs. Really, let the design process guide you. If you don’t like it - move on. If you like it - figure out why. Ruth: When we meet with brides sometimes there will be an idea that is vocalized but none of the parties can really visualize until the proofing process starts. How did you like the back and forth proofing process? Tommi: The proofing process with Ann is awesome! Honestly, every time I got a new proof I got so excited. I don't think I would have achieved the same results or have able to let go of some of my old ideas and focus on what I really wanted without Ann’s proofing process. She’s my friend, but it showcased how talented Ann is and how hard she works to understand each bride’s vision. Thanks for taking time to talk with us Tommi! 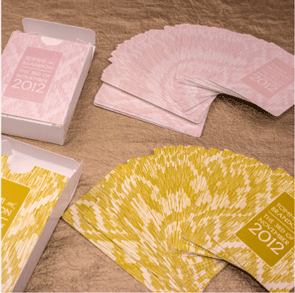 We are so, so thrilled with your invitations and look forward to working with you again soon on your thank you cards.